The inaugural exhibition of the Amos Rex museum designed by Helsinki-based firm JKMM will run until early January 2019. The inaugural exhibition of the Amos Rex museum designed by Helsinki-based firm JKMM will run until early January 2019. 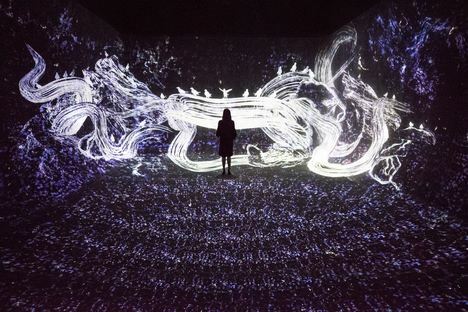 Massless is an immersive digital installation by renowned Japanese art collective, teamLab that uses the iconic space of the new museum to give visitors a site-specific, multimedia experience. The new Amos Rex museum in Helsinki (link), an underground space designed by Finnish firm JKMM, which also incorporated the refurbishment of the landmark 1930s Lasipalatsi building and remodelled the public Lasipalatsi Square, opened to the general public on 30 August with an exhibition by the Japanese art collective teamLab, famous for their immersive digital installations. 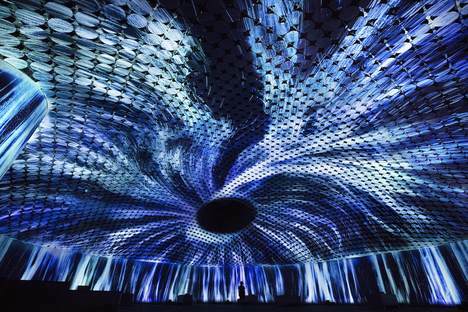 Vortex of Light Particles is the name of the installation that occupies the largest exhibition space in the museum designed by JKMM Architects. 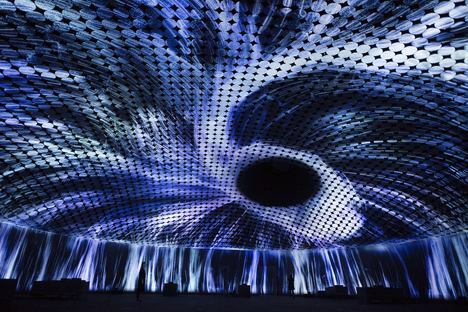 The roof and vast dome that pushes up into the square above provides the canvas for this audio-visual artwork, where more than 50 projectors create the illusion of water defying gravity and flowing upward towards the ceiling. The blacked-out skylight in the roof gives you the impression that the water is being sucked up into a black hole and that you might be next. Alongside this new artwork for the Finnish museum, the teamLab exhibition at Amos Rex comprises other works that have been specifically recreated to fit the museum spaces, including Graffiti Nature: Lost, Immersed and Reborn. 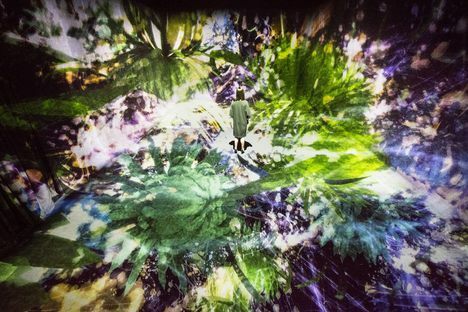 This installation extends through different rooms and is an interactive display of plants and animals. Their images are projected onto the floor and ceiling and reflected in mirrors in psychedelic colours that are always growing and eating and vanishing, and reacting to the movement of visitors. 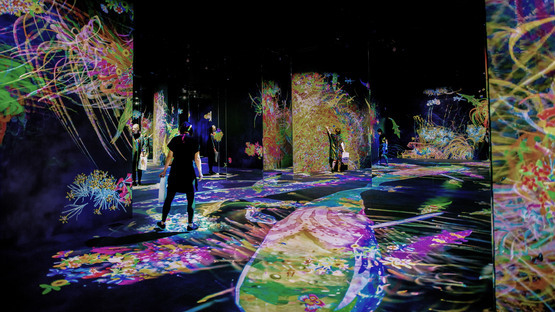 It fully reflects the philosophy of the teamLab art collective according to which the characteristics of digital technology enable the artworks to more freely express the capacity to change. Viewers engaging with their surroundings can cause a perpetual change to an artwork; the interactive relationship between viewer and artwork makes the visitor an integral part of that artwork. Rounding off the Massless exhibition are two installations, Crows are Chased and the Chasing Crows are Destined to be Chased as well, Transcending Space and Black Waves. The former is an interactive digital installation in which visitors can walk around freely in a space that completely surrounds them with projections on all sides. Crows are rendered in light and fly around the space, leaving trails of light in their paths and creating spatial calligraphy then bursting and turning into flowers whenever they touch each other or a visitor. 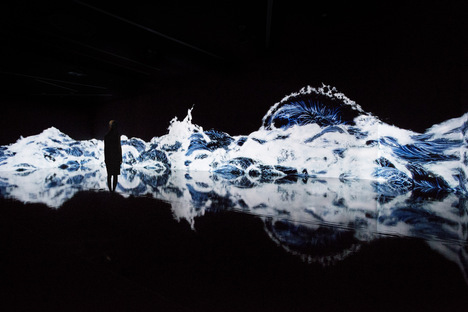 In contrast, for Black Waves the movement of waves in water is simulated in a computer-generated 3D space, creating what teamLab refers to as ultra-subjective space, where visitors not only observe nature but think of themselves as being part of that nature, just like ancient cultures. 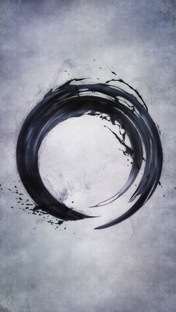 In the museum lobby, Enso introduces Massless in an installation that explores the Zen practice of drawing a circle with a single brush stroke. Here it is rendered as spatial calligraphy, reconstructed in a three-dimensional space to express the depth, speed and power of the brush stroke. 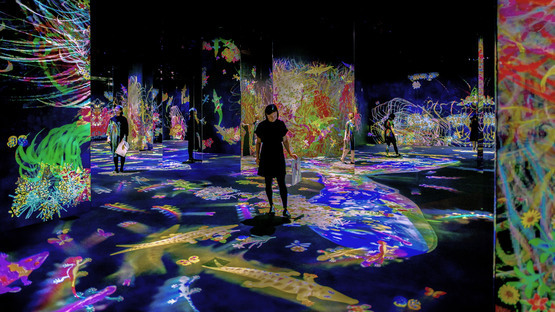 Massless by teamLab is an all-encompassing experience of the architectural space and the digital world, where visitors not only immerse themselves in art, they actually become part of it.